From its US-based roots, Ralph Lauren literally oozes the American dream. Created by its namesake, Ralph Lauren, in the 1960's, the company has evolved to become one of the world's most successful multinational, million dollar enterprises. Not only does it create and sell the most luxurious apparel, footwear, accessories and gifts worldwide, but it is a complete lifestyle statement in itself. From fragrances, eye wear, clothing for men, women and children, to accessories and home collections, each item combines high quality workmanship and materials with timeless design. If you cherish a life that is sophisticated and uncomplicated, with an appreciation of high quality, timeless classics, then you will already know and love Ralph Lauren. Add Ralph Lauren to your Favourites list and be the first to know every time they have a Sale on! 1st January 2018 - Ralph Lauren New Years Day sales for 2018. 7th May 2018 - Ralph Lauren Early May Bank Holiday sales for 2018, add to your diary now! July 2018 - Ralph Lauren Summer 2018 sales, joining us? 23rd November 2018 - Ralph Lauren Black Friday sales in 2018 start on Friday 24th November. Add products from Ralph Lauren to your Love Sales list. Get the Love Sales button now! Ralph Lauren Cyber Monday Event is on. The more you spend the more you save! Find a bargain to suit you today! Ralph Lauren Black Friday Event is on. The more you spend the more you save! Find a bargain to suit you today! 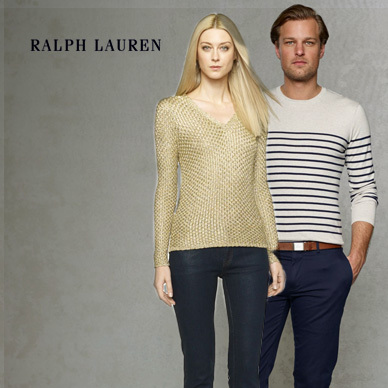 Ralph Lauren August 50% off Sale is now on across all clothing! Find your perfect style today!